Later this month, locals will have to make a choice. It may not be easy. 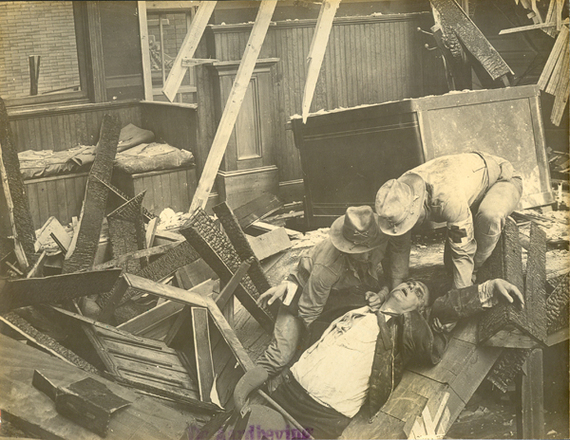 Whether to see the latest earthquake disaster movie, San Andreas, or to see an early and possibly first ever feature film about the 1906 earthquake and fire, When the Earth Trembled, from 1913. San Andreas, a blockbuster which stars Dwayne Johnson and is rated PG-13 for "intense disaster action and mayhem throughout," opens in theaters across the country on Friday, May 29. That same day, the San Francisco Silent Film Festival premieres the newly restored When the Earth Trembled, filmed 102 years earlier. The latter film, something of a blockbuster in its day, has not been screened locally in more than a century. The May 29 showing of When the Earth Trembled is its only local screening. It is also a rare treat, as many of the films released by Lubin, the company that made it, were lost in a huge explosion that rocked the studio's film vaults in 1914. When the Earth Trembled opened in San Francisco in November, 1913 at Grauman's Imperial on Market Street (across from the Hibernia Bank), and reportedly thrilled big crowds, according to accounts of the time. Local newspapers noted the film's "high dramatic standard" and "great magnitude." The papers also described it as a "pictorial presentation of positive sensation." That's two-thumbs up in today-speak. In 1913, early film mogul Siegmund Lubin decided to produce films longer than the one- or two-reel (10-25-minute) works that were then the norm. In keeping with his belief that "spectacles and disasters" were what audiences wanted to see, he produced his first feature-length production, a three-reel film titled When the Earth Trembled or The Strength of Love. The film, which stars Ethel Clayton and Harry Myers, has the 1906 San Francisco earthquake and fire at its center. And of course, like all disaster films, there is also romantic entanglement. Earlier this year, the film was restored by the San Francisco Silent Film Festival and the EyeMuseum in the Netherlands, with material from EyeMuseum, the British Film Institute, and the Museum of Modern Art in New York. The restored print premiered on March 28 at EyeMuseum, and will be shown for only the second time at the Castro Theater during the 20th annual San Francisco Silent Film Festival. The restoration of When the Earth Trembled was spearheaded by Rob Byrne. The San Francisco film preservationist had his work cut-out for him putting together a film he describes as not unlike an "action-packed TV miniseries." There are three known surviving copies of the 1913 film, all of which are incomplete. Elements from all three of the surviving prints were required in order to reconstruct the original three-reel, approximately 43-minute, feature. Damage to the surviving elements had be reversed as best it could, and variations in scenes and the silent film's inter-titles had to be resolved. On Thursday, May 14th, Byrne will describe the process of reconstructing and restoring Lubin's historic feature, including the original color-tinted sequences, at the Presidio Officers' Club in San Francisco. Start time is 7:00 p.m. Byrne, who specializes in the restoration of early and silent era motion pictures, also serves as president of the board of directors of the San Francisco Silent Film Festival. Films restored by Byrne include Sherlock Holmes (1916), which will also be screened at this year's Festival, and the San Francisco-set The Last Edition (1925), which played at the Festival in 2013. 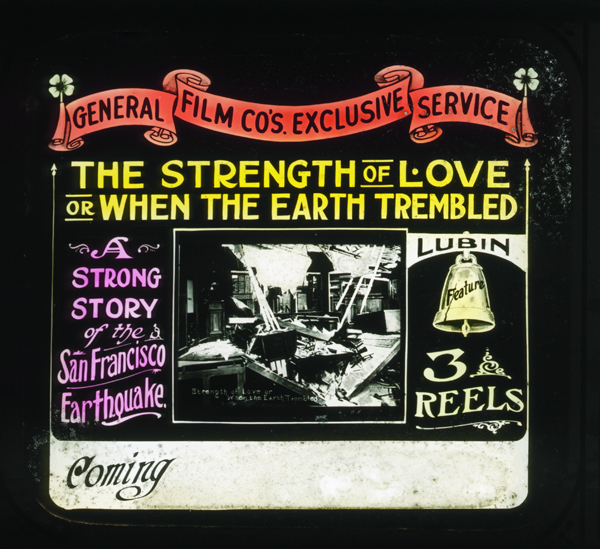 When the Earth Trembled will be shown at 4 p.m. on Friday, May 29th at the Castro Theater, as part of the San Francisco Silent Film Festival. Co-presented by the California Historical Society, the film will feature live musical accompaniment by Stephen Horne. When the Earth Trembled will be preceded by a short related work, A Trip Down Market Street (1906), which was shot just days before the great earthquake and fire. Thomas Gladysz is a San Francisco arts and entertainment writer and early film enthusiast. He is also the director of the Louise Brooks Society, an online archive and international fan club devoted to the legendary silent film star, which he founded in 1995. Gladysz has organized exhibits, contributed to books, appeared on television, and introduced the actress's films around the world.